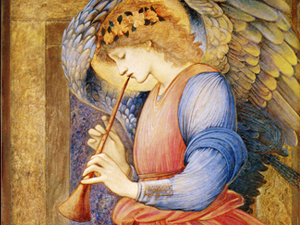 You are here: Home » Featured » Liturgical Worship or Concert Attendance? Liturgical Worship or Concert Attendance? On Friday, February 4, I attended the Rock and Worship Roadshow at the Resch Center in Green Bay, WI. 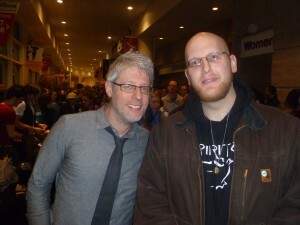 [i] I went because the artist Matt Maher was playing and I hoped to have the opportunity to meet and talk with him. [ii] I am glad to say that I was able to do so. Just after Matt Maher played, the Resch Center got really quiet as the host for the evening took the stage and gave a push for donations to keep the costs for the concert down so others could attend and be blessed. Maher came back out and started to play a soft song while buckets (literally) were passed around the Center to collect the donations. At some time during the performance of the heavy metal band “Thousand Foot Krutch.” I connected the environment of the concert with an all-too-familiar “boredom” that young people feel when they attend Mass. This made me start to reflect about the Liturgy and contemporary culture with respect to music. When I was teaching in Alabama, I discussed with my students some of the differences between Catholicism and Protestantism. My otherwise Catholic students stated some contradictory facts, one of which was they sometimes attend Protestant services because — in the words of one female student — “they are more funner.” She was referring to the upbeat style of music that endears young people [read: the rock-n-roll, “praise and worship” (so-called) genre of music]. At the concert, I began to appreciate on a deeper level that young people are “bored” at Mass because they aren’t “entertained.” They go to a rock concert so as to be entertained. Add to the fact that “Christian” rock concerts have a “worship” element, it is reasonable to state that some sort of connection is made between the music and worship. I am concerned about how this is affecting people’s view of the Mass. I have in my mind a concern for the practice of the art of contemplation, toward which is geared all Christian prayer. Contemplation necessarily requires silence because it is in silence that God speaks. How is it possible to attain to this goal of Christian prayer when one pumps his or herself full of the busy-busy-busy, thrum-thrum-thrum that is the constant noise made by the so-called “praise & worship” music? In my experience working with young people, I continuously hear, “You have to reach them where they are at. This is the music they know and so we use it to reach them.” Much can be said in favor of this statement and I understand the thought behind it. However, I wish to point out that with respect to contemporary Christian music and the Liturgy, we might be defeating our efforts to evangelize and catechize young people so as to help them with understanding and conversion for insertion into the Mystery of Christ. As a Christian society, we have our own culture, our own Tradition that has been established by Divine Authority. We believe what is good in other cultures can be used for the sake of propagating the Gospel, but there is always a fine-line between what is sacred and what is profane. By its very history, rock music falls into the category of profane. Despite this, otherwise well-meaning Christians noticed the effect this style of music has upon people. They have capitalized on it by taking the style, putting “Christian lyrics” into it and call it an “alternative” for Christians. Remembering the distinction between the sacred and the profane, allow me to ask a question: With respect to music, are we perpetuating the secular culture that surrounds the genre of so-called “praise and worship” music or are we promoting an authentic Catholic culture? Sadly, I suspect that we are perpetuating secular culture. I suspect this because of what I see of the way young people treat and/or think about the Liturgy. These two beautiful pieces of our liturgical patrimony are intimately rooted in contemplation. In order for young people to understand them, they need to have inculcated within themselves a proper docility and disposition towards the contemplative life/prayer. In short: they need appropriate formation. What would happen if young people are never given (or worse, denied) such formation by those who have proper care over souls: namely, parents, educators, priests/bishops and religious/seminary formators? Certainly We know, and with you, Venerable Brethren, We deplore the fact that in our day the idea and the name of expiation and penance have with many lost in great part the power of rousing enthusiasm of heart and heroism of sacrifice….As a fact the notion of the need of penance and expiation is lost in proportion as belief in God is weakened, and the idea of an original sin and of a first rebellion of man against God becomes confused and disappears. Speaking about a musical genre — rock music — that, by its very nature, is highly expressive of the passions, the task of restraint is practically impossible. My challenge to all Christians is to remember that you are children of the Light. The Eternal Father has given you a rich patrimony that has been passed down through your forefathers. If the onslaught of secularism and relativism has reduced Western civilization to being a distant memory of its former glory, do not allow yourselves to run with the times. Be faithful to the Tradition, persevere and grow strong in it. “Do not conform yourselves to this age but be transformed by the renewal of your mind, that you may discern what is the will of God, what is good and pleasing and perfect” (Romans 12:2).